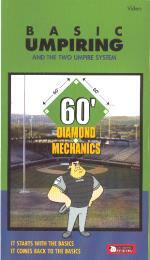 60' Diamond Mechanics is for umpiring Youth Baseball played on a diamond that has 60' bases. Baseball Umpire-in-Chief Andy Konyar takes you through the Two Umpire System in the beautiful setting of that Big Little stadium in Williamsport, PA ... With instruction, demonstration & animated graphics. This video is all you need to hit the field and be ready to umpire.